The reason I learned how to cook butternut squash was my uncle told me that butternut squash was a fruit when I was very young. I didn’t believe it was a fruit but I remember the delicious taste after he finished cooking it and this is still the best and easiest way to cook it for me. 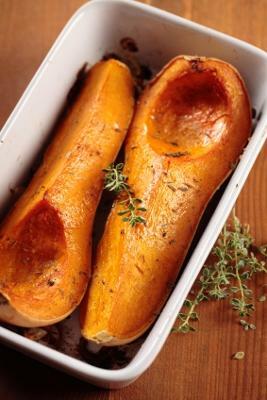 The ingredient list for this recipe is very small I only need one or two medium butternut squash, butter, nutmeg or brown sugar. If I don’t want it sweet I use olive oil, salt and pepper instead. After I wash the squash I cut it in half and clean the seeds and any loose stuff. I can either butter or oil a baking sheet and put the butternut squash with the cut side down and cook it for 25 to 40 minutes at 400 degrees depending on the size. I check on it at the 25 minute mark and if it is tender it is ready. If you want it sweet you can add butter, brown sugar and nutmeg and if you want it savory just add salt and pepper. I broil it for at least five minutes and let it cool before I dig in, if I don’t have nutmeg I will use cinnamon to give it that pumpkin pie flavor. Sometimes I like a different texture and I learned another way how to cook butternut squash which gives it a more vegetable feel. It involves cutting the squash in half, cleaning the inside and peeling the skin. After I peel it I cut it into small cubes, coat with olive oil, salt and pepper and place it on a baking sheet and cook it in an oven for 25 minutes at 370 degrees or until it is tender. When it is done you will have a great side dish to any entrée. Thank you very much for sharing this post regarding the new dish. I think it is one of the best dishes and I am very excited to try this dish as soon as possible. Join in and write your own page! It's easy to do. How? Simply click here to return to Cooking Q&A.